The FrameVR platform is a basic software architecture on top of which customizations can be applied to build a bespoke VR software platform. Basically, FrameVR represents a virtual space, shared by one or multiple users, in which 3D models can be uploaded so the users can deal with the 3D model to perform specific actions and interactions. – Enable/disable animations;just to name a few. Those features are used to modify the 3D model to the users’ likings and put the 3D model itself in different contexts to see what it looks/feels like. The range of features can be expanded and customized to meet clients’ needs, meaning that clients are allowed to ask for special features not currently available that will be developed especially for them. FrameVR has been designed to be as flexible as possible precisely because its purpose is exactly to be a “naked” structure to be customized and “dressed up” with all the required/necessary customizations. – the 3D models should not count more 2,5 million triangles;Once the final FBXs are available, users will only need to put them into the server for asset bundle generation and upload (automatic procedure managed by the platform itself). FrameS is an on premises only type of software which means it needs a proper hardware structure to work and perform as expected. Building a software based on the FrameVR structure leads to a completely customized product which will be developed for one specific client and will be sold to this one specific client only. This means the client will have to pay an upfront fee to buy a software that is going to be its own property and will never represent a standard product by any means. For that reason, no updates or new releases of this very product are planned unless explicitly required by the client itself. 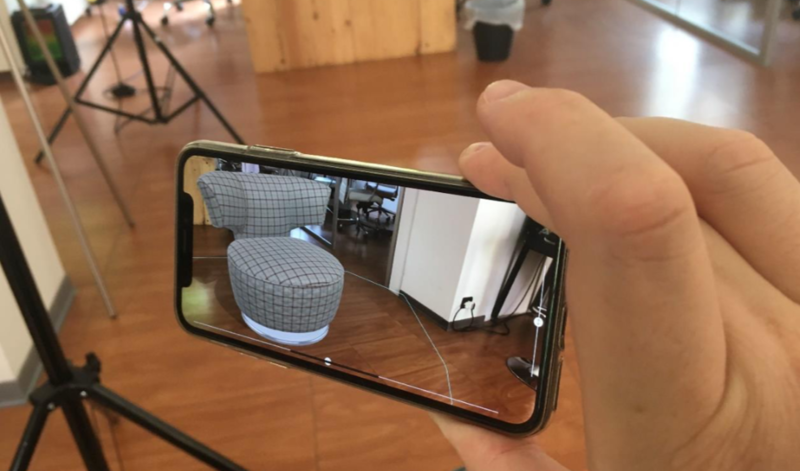 Nevertheless, every time we need to use the FrameVR basic structure to develop a new software for a new client, our developers apply each and every available/necessary update to the basic technology in order to keep the resulting product up to date and guarantee high levels of performance and stability. Updates will also include performance and compatibility tests with new hardware devices that along the time become available on the market. 3D Real Time product configurator. Officine has developed Frame3D, a core 3D Real Time product configurator that is the base of the customised products it offers its clients. The configurator consists in an interactive real time 3D environment, where every single action and interaction, with related refresh of video output, are recalculated moment by moment with no pre-rendered contents of any kind, allowing users to display corporate’s products in high quality, high definition and graphic detail. 3D models are saved into the corporate’s servers and can be uploaded into the configurator by synchronising the configurator itself with the server in order to update the internal library. Officine customises Frame3D in order to make the final configurator meet the client’s requirements, meaning that a dedicated UI will need to be designed and the available interactions and possible modifications to the products will have to be designed in order to respect the configuration rules set by the manufacturer. 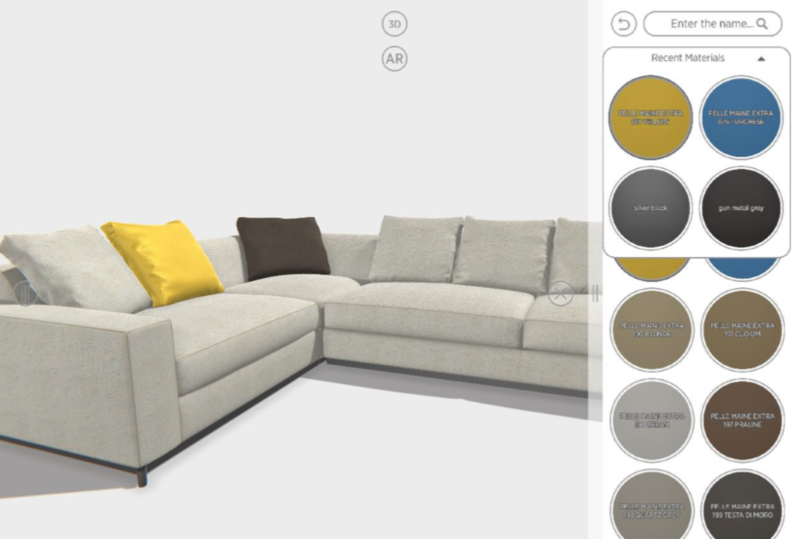 – displaying the product in AR (just by clicking/tapping on the AR button);to the users’ requirements, within a range of configuration rules set by the manufacturer. The configurator has the ability to communicate with any ERP system through a synchronisation process. The configurator provides the user with the cost of the product and the customisations in real time, creating an offer document, and sending the purchase order to the ERP system. This system just requires a few simple clicks, making the process seamless, fast, easy to manage, reduces risks of mistakes and doesn’t require any data-entry. Based on the corporate’s requirements, Officine can also integrate CRM features, to facilitate tracking of sales. Frame3D runs on PC, Mac and iPad-Pro. It doesn’t have special hardware requirements as the application adapts its level of performance and graphic detail on the GPU computational power of the hardware it is running into. The better the hardware is the more Frame3D will be able to perform with high graphic levels of detail. Building a software based on the Frame3D structure leads to a completely customized product which will be developed for one specific client and will be sold to this one specific client only. This means the client will have to pay an upfront fee to buy a software that is going to be its own property and will never represent a standard product by any means. Nevertheless, every time we need to use the Frame3D basic structure to develop a new software for a new client, our developers apply each and every available/necessary update to the basic technology in order to keep the resulting product up to date and guarantee high levels of performance and stability.